At this point it’s tough not to smirk or giggle or at least be somewhat skeptical when a trailer for yet another Kevin Costner sports-centric film comes to theaters. He’s just become Hollywood’s go-to guy for films about heart and competitiveness and smarts in sports, and the fact that McFarland, USA isn’t about baseball in particular might at first glance just look like the 60-year-old Costner is continuing to branch out into other sports in film. Last year, it was the NFL in Draft Day. Now, it’s high school cross-country. What’s next, Mr. Costner? Bass fishing? Put aside that line of thinking, at least this time. Directed by award-winning New Zealand film maker Niki Caro (Whale Rider) and based on a true story that’s just about as inspiring as they come today, McFarland, USA is an earnestly acted and beautifully shot film that will win you over, given an honest chance. Costner plays Jim White, a high school football coach who in 1987 moves his family to McFarland, California in order to take a job at the town’s high school as a life sciences and PE teacher. To Jim, his wife Cheryl (Maria Bello), and their two daughters, Julie (Morgan Saylor) and Jamie (Elsie Fisher), McFarland might as well be on another planet. The town, predominantly home to migrant worker families living well below the poverty line — “pickers”, as they call themselves — is as poor as poor gets and almost entirely Mexican or Mexican-American, so the Whites (and the irony of their names is lost on absolutely no one they meet), coming from Jim’s last job in Idaho, face quite a few challenges in settling into their new home. They don’t know the language, the food, the culture, or anything really about the hard lives lived by the people around them. Their first night in town, after seeing a parade of lowriding cars slowly cruising the streets, each and every face in those cars staring uncomfortably at the newcomers on their turf, they’re not even sure they can be safe in their new house. As Jim at least tries to settle into his teaching job, he does notice a few things about his students and their talents. For one, the school really has no business having a football team, which they do. Second, a few of the kids, notably Thomas Valles (Carlos Pratts), Johnny Samaniego (Hector Duran), Victor Puentes (Sergio Avelar), Jose Cardenas (Johnny Ortiz), and the Diaz brothers, David (Rafael Martinez), Damacio (Michael Aguero), and Danny (Ramiro Rodriguez), seem to be able to run laps around their classmates, and are capable of running lap after lap around the school’s athletic field without expending much effort. Investigating a little further, he discovers that there’s money set aside in the state’s high school athletics budget for establishing new sports like cross country, and for paying coaches to coach those sports. After using some creative means to convince each of the kids and the school’s principal to get on board, the McFarland High Cross-Country team is born. But getting the team started is, of course, just the beginning of things. Jim still has to figure out how to reach these kids, some of whom aren’t exactly trusting of their new coach, who they all call “Blanco” because, well, it’s his name, right? He’s also never coached track sports before, and his record as a football coach, in part, is what made the move to McFarland the only move the family could make. In the course of learning how to mentor these kids, all of whom wake up before dawn to hop in the back of pickup trucks with their families to work in the nearby produce fields before even going to school, Jim gets to know each of their families and their individual challenges, gets to experience firsthand the work they do and the hardship that drives them to be such a tight-knit, family-first community. And his students, seeing the effort their coach is making to help them be more than what other schools and the rest of California outside of their town expects them to be, start to see that cross-country and running could be a way to go further, and accomplish more than those that came before them. The kids find a purpose beyond just helping their families put food on the table day in and day out, and Jim and his family find the thing they least expected to find when they arrived: a home. 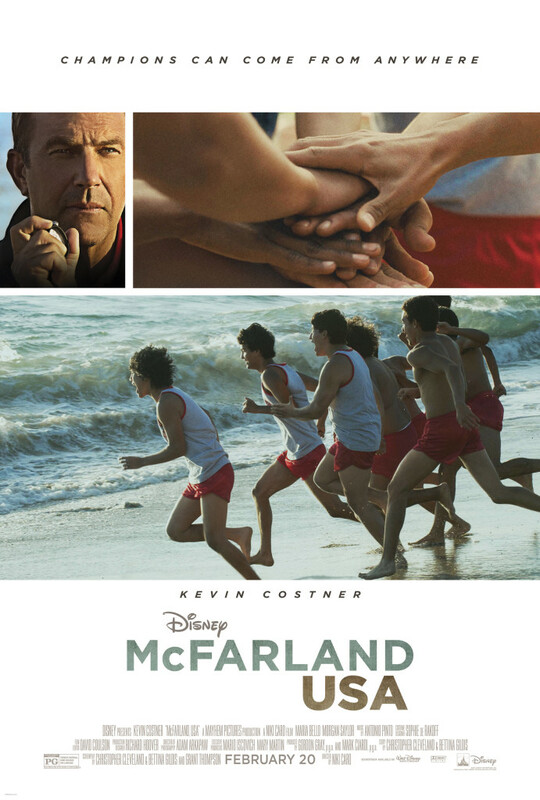 McFarland, USA has some similarities to Walt Disney Pictures’ feel-good sports movie from last year, Million Dollar Arm, which also charmingly and earnestly told a story of culture shock and greatness discovered in the most unlikely of places. The two films (both produced by Mayhem Pictures for Disney) approach the worlds and cultures of the young athletes whose experiences provide the emotional core of each film with the clear goal of bringing those worlds to life in a tangible, authentic, and honest way. That effort, and the time spent by cast and crew to provide a glimpse into these times and places that’s as real as possible, goes a long way toward allaying any feeling that the films are following a formula or that you know where the film is going. 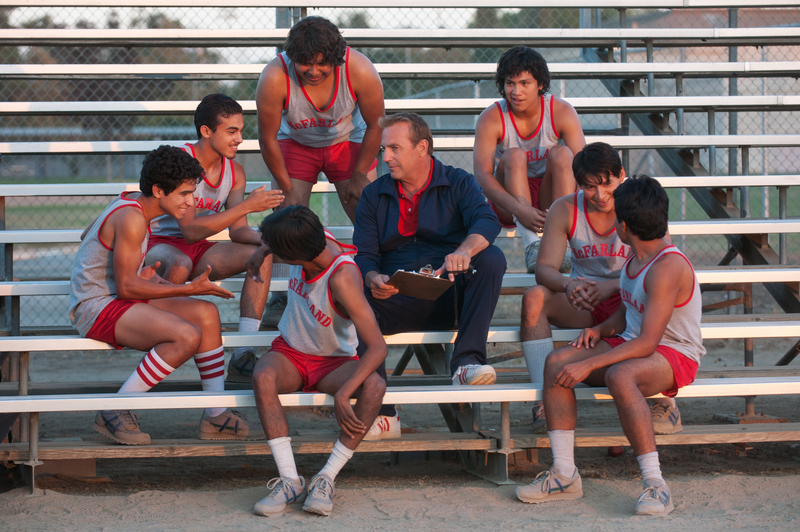 Here, in McFarland, USA, the time, place, and culture being brought to life might be more familiar to American audiences, but that doesn’t at all diminish the need for care and a gentle hand in terms of honoring who these people are and what’s important to them without coming off as manipulative or heavy-handed in the telling. Working from a story treatment by Chris Cleveland and Bettina Gilios (2006’s Glory Road), Niki Caro, working with cinematographer Adam Arkapaw (HBO’s “True Detective”), lets the vibrant personality of McFarland’s Latino culture inform just about every scene, and the film often feels as though the director simply turned the camera on in the homes and businesses of McFarland and got out of the way. It’s within the homes and intimate spaces of these hard-working families, as well as out in the produce fields and McFarland’s distinctive expanses of almond mounds covered in plastic that serve as a training ground for the team to prepare for different elevations, that the film really shines and its cast wins you over. What you see on screen at all times feels genuine, and the emotion depicted feels earned, which is quite a testament to Caro’s talent for working with her cast, a number of whom had never acted previously and are, in fact, real-life residents of the town and its surrounding communities. As for Costner, he brings to the table more or less what you expect him to here. It’s a quiet, understated performance, nothing we haven’t seen him do before but exactly what this film needs in terms of presence. There’s a reason he was chosen for this role — yes, he’s cast in these types of roles often, but it’s because he does them well, and what he delivers usually outweighs any negative reactions that might come from the public reacting to “another Costner sports movie.” Besides, he’s not the real star here, anyway, despite his name being atop the title of the film in the marketing marketing materials. The real star of the film is this remarkable story and the real-life legacy of champions that came from it. That story, and the way cast and crew bring it to life here, is what makes the film worth seeing, and telling others to go out and see, as well. Starring Kevin Costner, Maria Bello, Morgan Saylor. Directed by Niki Caro. Rated PG for thematic material, some violence and language.